A lovely friend at work gave me some of the cardmaking equivalent of magazine cover kits, to help me try out new techniques. A lot of these things were probably super simple to veteran papercrafters, but it was all totally new and exciting to me. I made this thing! 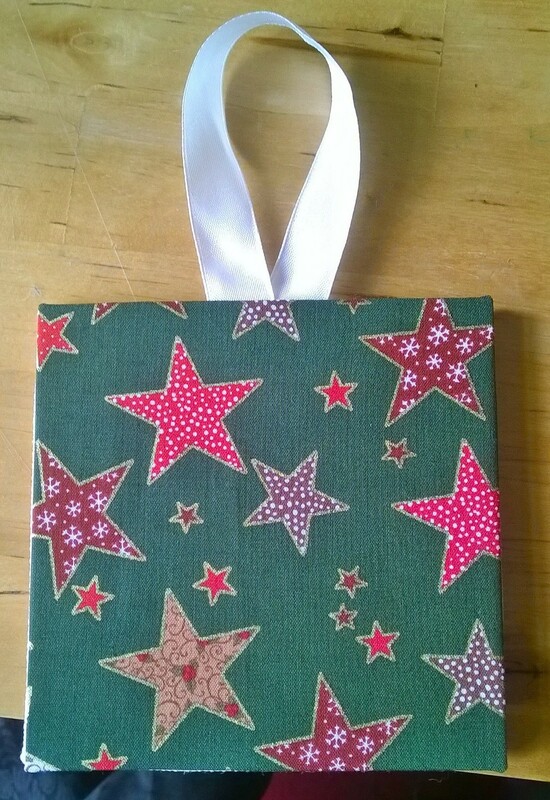 It’s an easel card, which means the recipient can pop it up so that it stands like shown above. 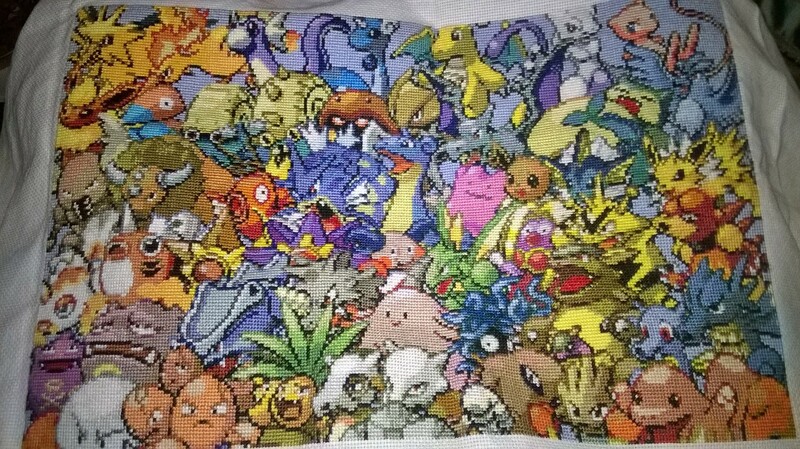 I mostly followed the instructions, but as I do with cross stitch, I got a bit carried away and just went off in my own direction a bit with gems and ribbons and so on. The main thing that came out of these experiments is: when making funny shaped cards, what are you supposed to do for an envelope? I ended up just using some that were way too big, but it looked a bit scruffy and I wasn’t happy with this solution. Are there custom envelope sizes? Am I supposed to make my own? I never knew envelopes could be such a problem! I’ve also been doing some tapestry this week, but I don’t want to show you that until I’ve found a suitable frame or finish for it. 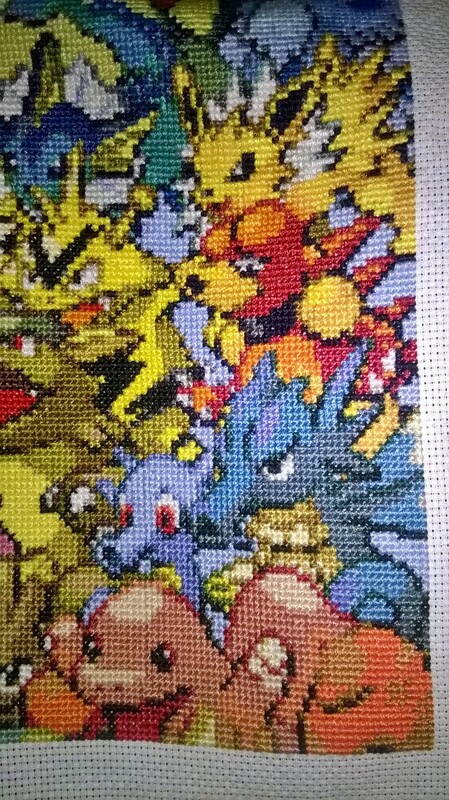 I don’t have much to share this month, I spent most of April working on my Pokemon picture, which I talked about here. I adapted this cutie from a much larger sampler from the book ‘The Countryside In Cross Stitch’ by Christina Marsh, which I found for the outlandish sum of 1 whole penny on Amazon. I was inspired by a recent family day trip to Wales, where several of my relatives spent the day exclaiming over the many (very many!) 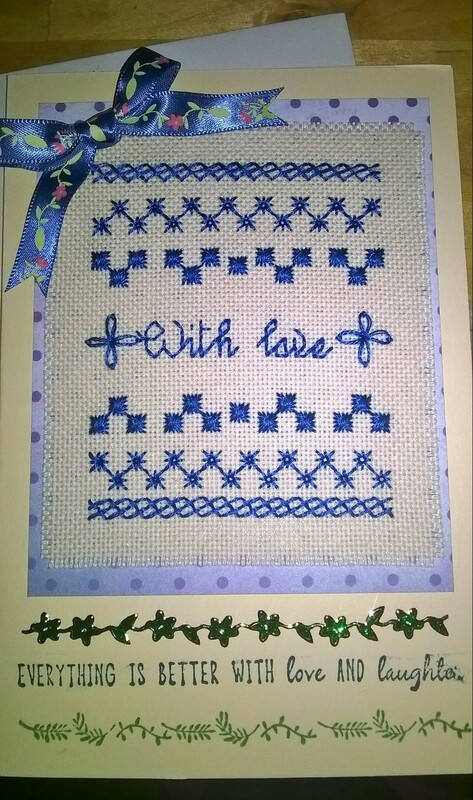 little birds visible on the farm, so I did a quick stitch of one of their favourites for a house warming card. So there you have it – my one and only small project tackled this month! It’s been a while, hasn’t it? But finally I can say: Page 10 is complete! This page was more scary and weird than cute, but I love the colours on the Seadra (the big blue seahorse-looking guy on the middle right). Here’s how the whole thing looks now I’ve done 10 whole pages! I just love it so much. So I’m now 2/5ths done, with 25 pages to go. I’ve revised my ambitions from ‘finish before I’m 30’ to ‘finish…at all’ since the older I get, the more real life drama seems to get in the way of stitching time! 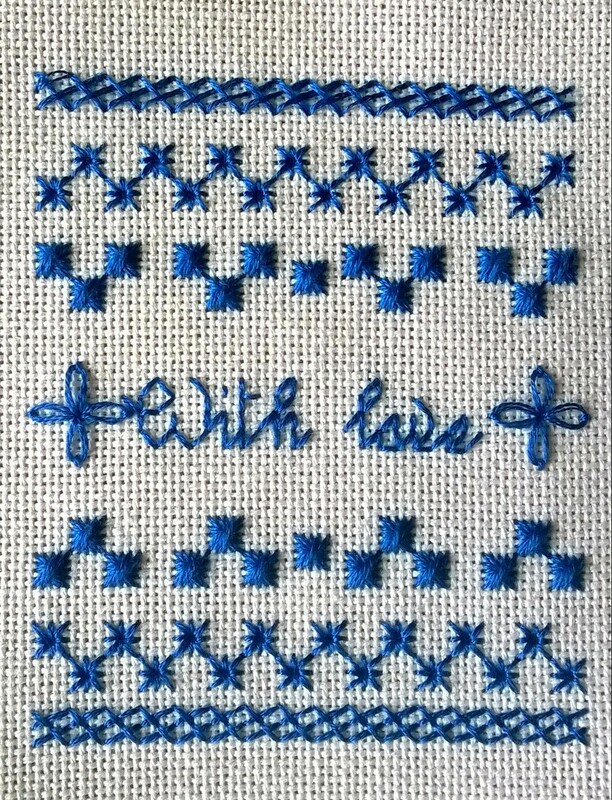 I was trying to go for a sort of rustic / folk art kind of feel to go with the fairly traditional sampler, but as usual I got carried away and had to add something sparkly. Never mind, I know the recipient likes sparkles too! And with this done, I’m back to focusing 100% on the Pokemon picture. Hopefully I can finish Page 10 this week! As I promised myself i would, I’ve gone back to work on my Pokemon picture, and it’s coming along quite quickly. There are lots of largeish, solid areas of colour so i can really enjoy watching the picture appear as I stitch. I think my lazy daisies are really improving from my earlier attempts! I don’t know what it is about this stitch that my hands just don’t seem to want to do. I can French knot no problem, I genuinely enjoy backstitching, but my lazy daisies look a bit lopsided and wilted most of the time!